The Nice Icy Land was crackling with busy-ness. 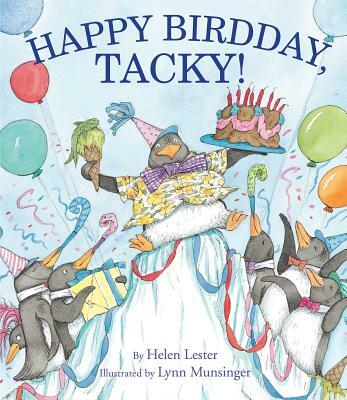 It had taken weeks and a lot of whispery chirps for Tacky the Penguin's friends to plan a Perfect Surprise Birdday Party for him on his special hatchday. With songs, presents, cake, fishy ice cream, and surprise entertainment from Iglooslavia's own Twinklewebs the Dance Queen, how could anything go wrong? But it's a comedy of errors . . . and all is far from perfect. Luckily, Tacky's good cheer -- and his flippity dance moves -- save the day with a flap of his flippers and a tap of his tippywebs. Munsinger's adorable, expressive penguin illustrations are the icing on the cake.